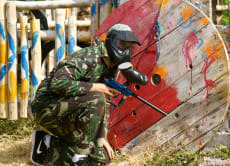 I'm Made and I'm a manager of the Paintball field in Bali. I always enjoyed having my adrenaline pumped, and paintball is a perfect way to do it. Opened in 2012, our compound is now the biggest in Bali, with a size of 2 hectares, having two different battlegrounds inside. We are using only the newest, professional equipment. We also provide all our visitors with insurance, to ensure you not only have fun, but also in a safe environment. I hope I can be your host soon, and help you have the best time in Bali! This was a great experience, both me and my boyfriend really enjoyed it! The staff a as pleasant as they get and extremely helpful! Would definitely recommend this to other! Thanks!! 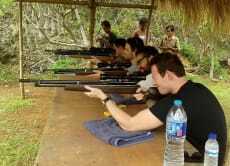 I took my sons shooting and we all had an absolute ball. Staff extremely friendly. Four of us went. Picked up from Sanur and driven to the range. Instructions given and then the fun began. Shooting at glass bottles rather than targets initially didn't sound so good but you knew when you got your target (bottle). Fun way to spend a few hours away from the beach.